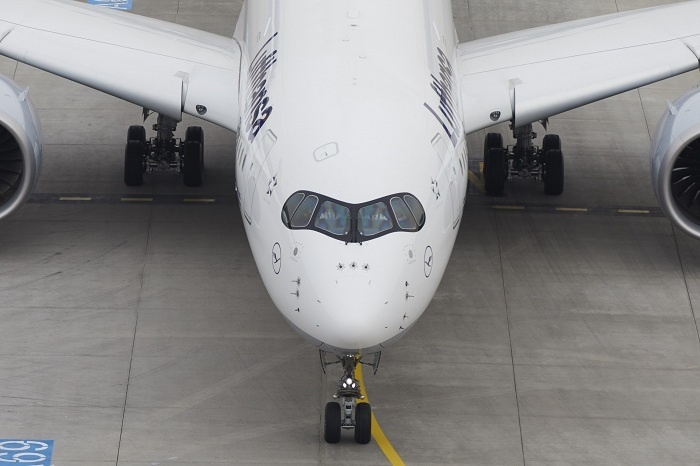 Lufthansa’s Airbus A350 fleet in Munich is growing once again – with the third A350-900 landing on at its new home base. Captains Andreas Jasper and Pol Uffer transferred the aircraft from Airbus in Toulouse to Munich. With the addition of this third member to the fleet, Lufthansa will also be adding Mumbai to the A350-900 flight schedule. The first flight to the Indian metropolis is planned for April 15th, 2017. At Airbus, the new aircraft carried the production serial number MSN087 and will now fly for Lufthansa under the international registration number D-AIXC. The A350-900 is currently the world’s most advanced and most environmentally-friendly, long-haul aircraft. It uses 25 per cent less kerosene, produces 25 per cent fewer emissions and is significantly quieter on take-off than comparable types of aircraft. In February, the first of fifteen aircraft arrived in Munich to be stationed there. The A350-900 has capacity to carry 293 passengers – 48 passengers in Business Class, 21 in Premium Economy Class and 224 in Economy Class.